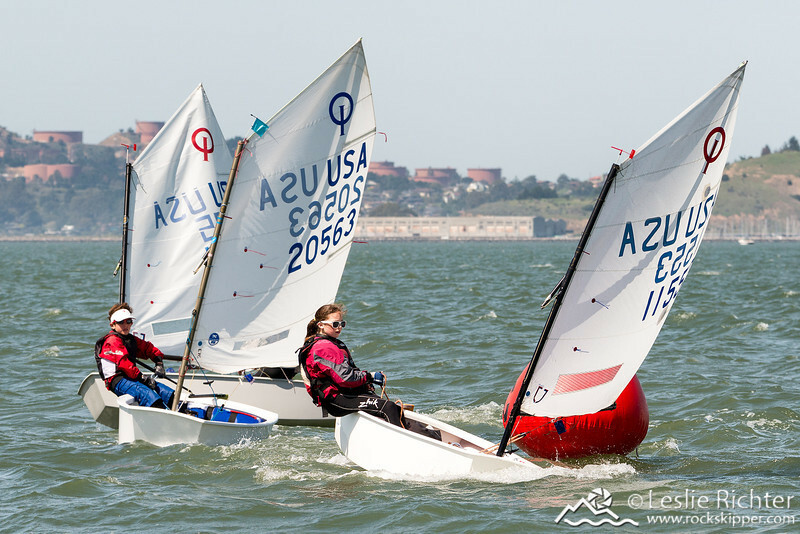 What a great day of youth sailing on Sunday, April 6, 2014 during the Harken Opti Challenge #2 hosted by the San Francisco Yacht Club. Very light conditions built to over 15 kts, with a strong flood tide -- perfect conditions on the Olympic Circle in San Francisco Bay! There may be some duplicates here - sorry if I didn't catch them all. If you're looking for photos of a specific competitor, please email me at leslie at rockskipper.com, with the sail number and any distinguishing features (e.g. hat, pfd, boat color etc,), and I'll see what other images I can find. Prints may be ordered online by clicking on "Buy". The metallic paper really looks terrific with the water and the sky -- give it a try! I can also provide custom collages, and larger size archival prints. With Mother's Day just around the corner, an 8x10" or large print will make a great gift.